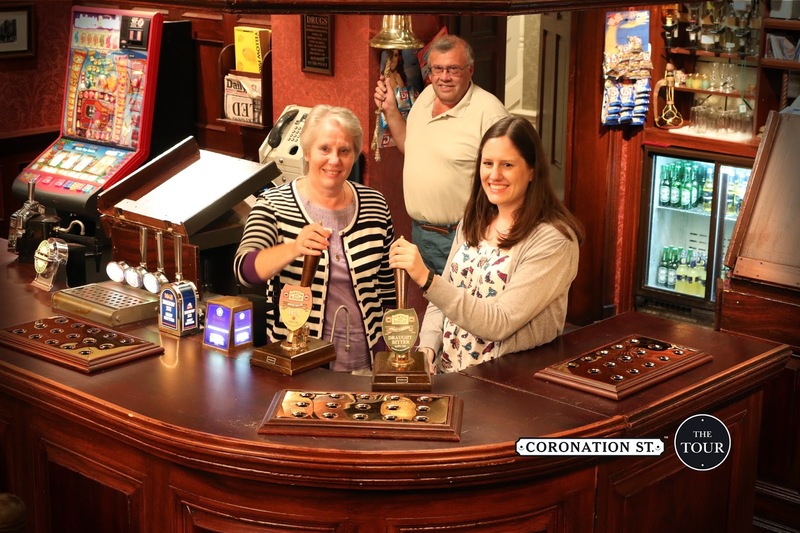 We all spent an enjoyable evening moonlighting behinds the bar of the Rovers Return this evening while we enjoyed the Coronation Street Tour during a visit to the now redundant ITV studios at Quay Street Manchester. A complete new set has now been built at Media City at Salford Quays, and has been in use since the beginning of the year. Sadly the end of our stay in London with friends is near and tomorrow we make our way back up t'North courtesy of Virgin Trains. Today we kept free so we could do whatever we fancied dependent on weather. As it turned out the weather wasn't too bad, with mainly sunshine until lunchtime and the occasional heavy shower afterwards. It didn't deter from our enjoyment at all. 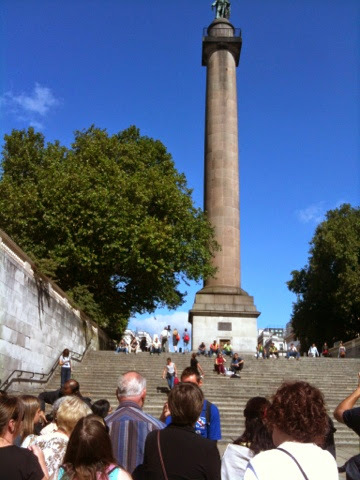 We had a leisurely start after yesterday's busy schedule and took the Tube to Tower Hill. 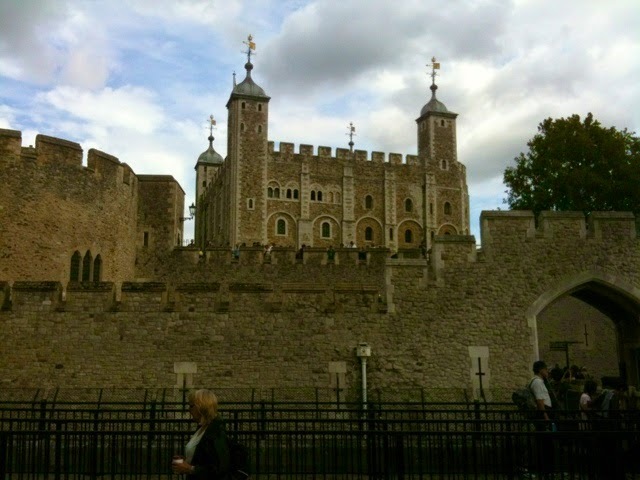 There is much to see and do in this location including the Tower of London, Tower Bridge and HMS Belfast. 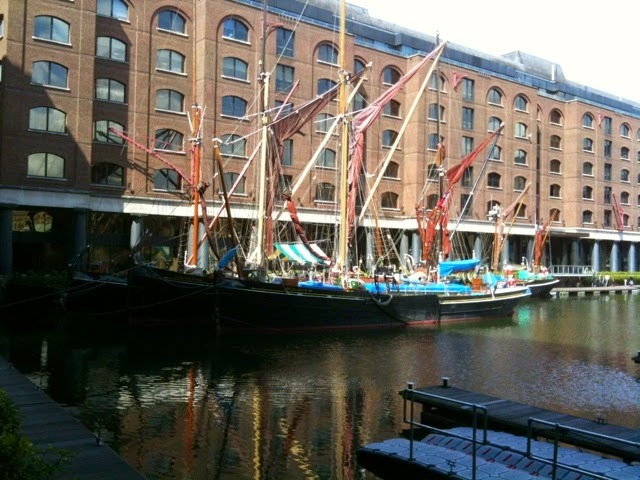 What we didn't expect though, and hadn't managed to find on previous visits was St. Katherine Dock, a little gem of a marina located through a ginnel at the bottom of Tower Bridge. 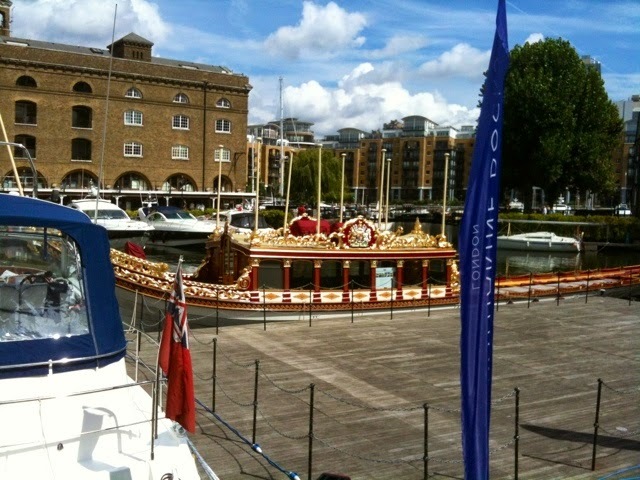 Once inside there are restaurants bedecked with flowers, vintage Thames barges, super yachts and Gloriana, the rowed barge that took part in the Queen's Golden Jubilee river pageant. 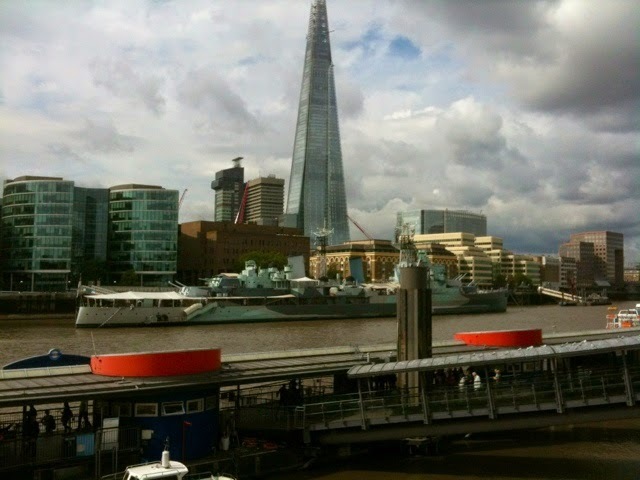 There is the Shard on the South side of the Thames, behind HMS Belfast. 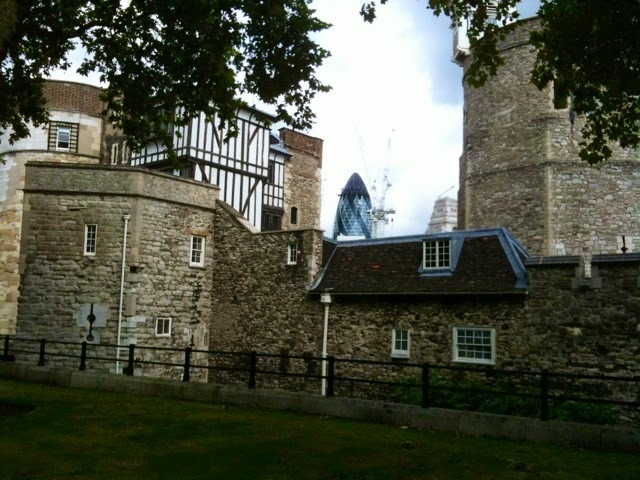 And the Gherkin on the North side visible here behind the Tower. 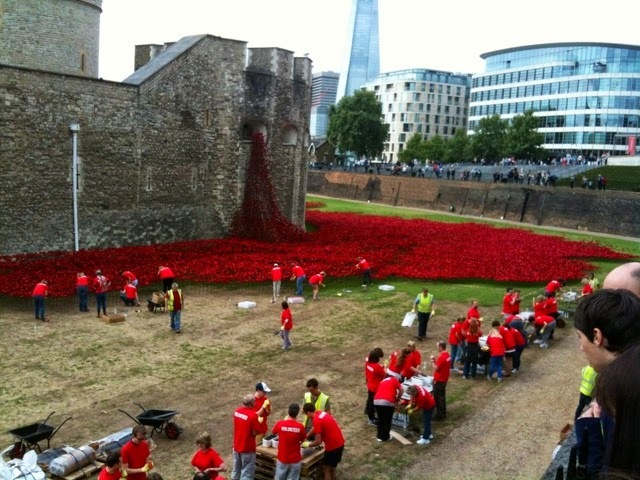 The highlight of today's visit was to witness the volunteers placing a poppy for every serviceman killed during the First World War, around the moat of the Tower. When they are finished the area will be a sea of red. 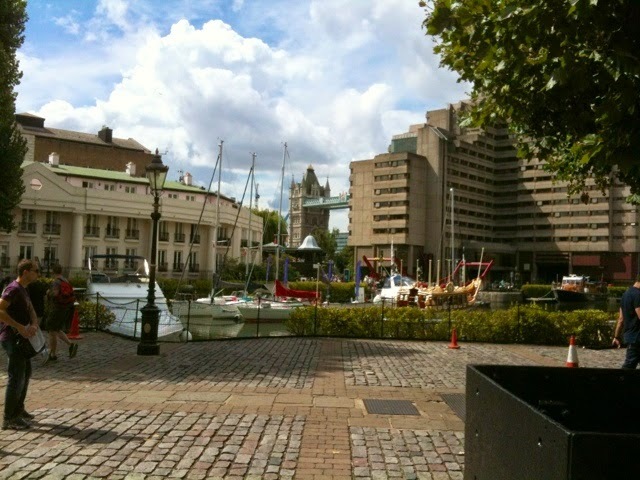 We enjoyed lunch at a restaurant called Indian Fusion, just on the South side of Tower Bridge. We had picked up this from the 2 for 1 offers that are linked to our rail journey, and I printed vouchers before we left home that would allow us two free main courses. 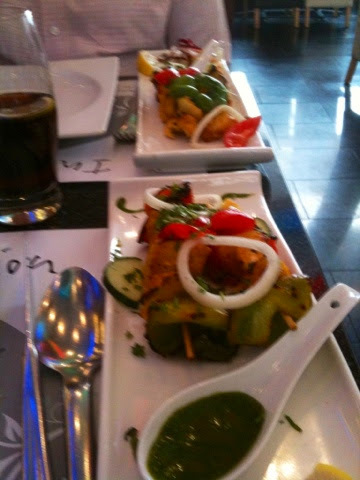 It is a most unusual Indian restaurant in that the decor was modern contemporary and the food was served nouvelle cuisine style with decorated artistically presented plates. 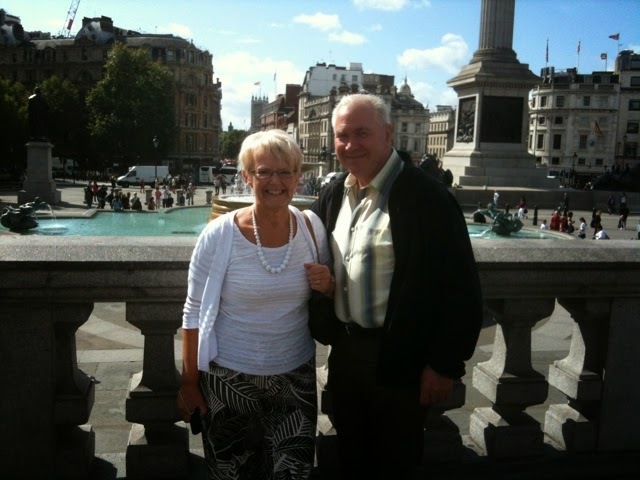 Quality was exceptional although the price was more than we are used to at home even with our vouchers taken off. Very enjoyable in any case. 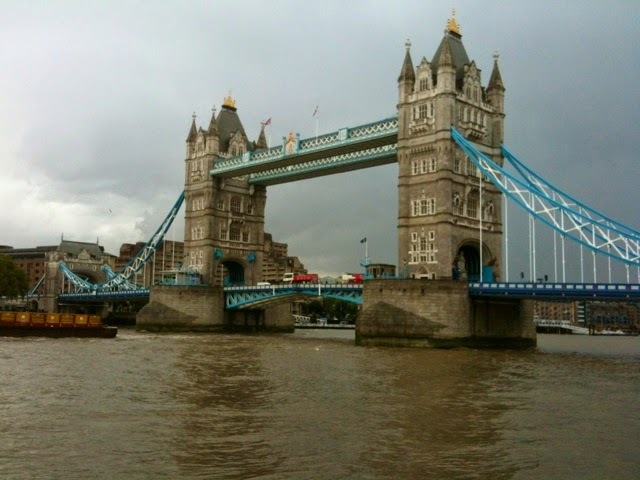 After a walk down the riverside towards London Bridge we caught the tube 'home' via London Bridge station before the more expensive rush hour fares kicked in. Our TFL Oyster cards allow us off peak travel all day long using either the Underground, London buses, or Docklands Light Railway for a maximum of £7.70 or £10.60 if peak time journeys are made, as we had to do yesterday to meet our schedule. 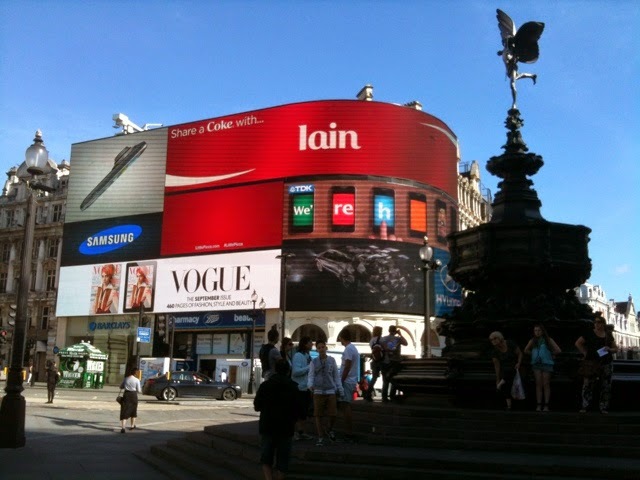 Another Fabulous Day In London. Today we had more great weather for our second day in the city. 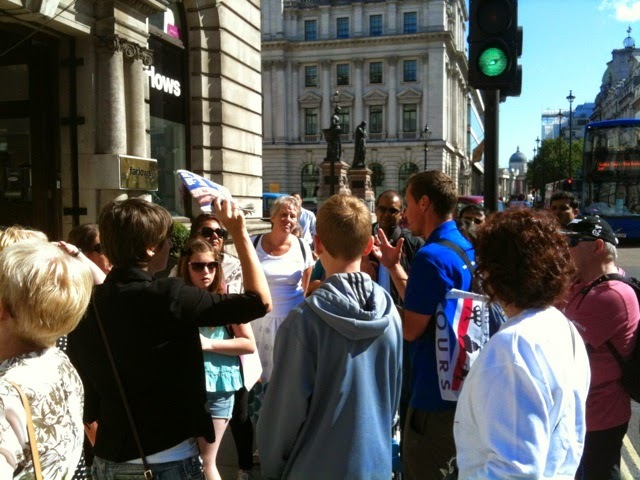 The arrangement was to meet Matt of Fun London Tours at Piccadilly Circus. 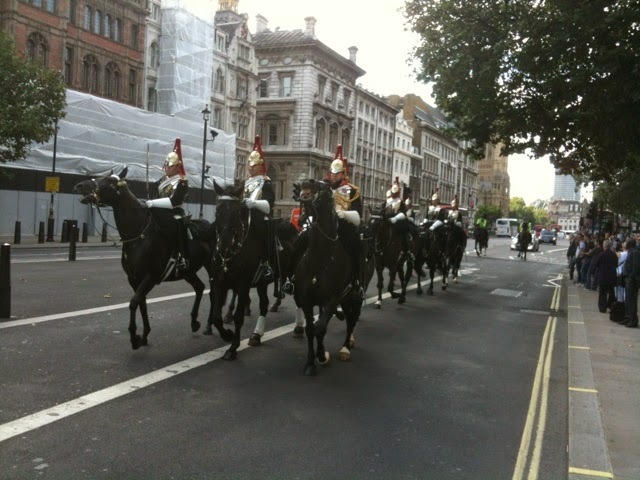 We had booked a walking tour to get the best view of the changing of the guard at Buckingham Palace. 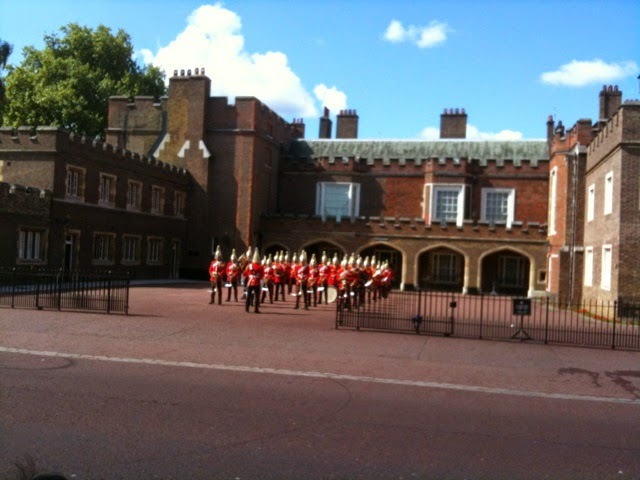 When the group of 22, made up of British, American, Australian, Spanish and Indian visitors were all accounted for we made our way to St. James' Palace to witness the inspection. On the way Matt paused at various sites of historic interest to pass on interesting information in a fun and humourous way. As we arrived at our first destination it became apparent that the band supporting today's parade would be from the Lifeguards. As they marched off towards Buckingham Palace Matt guided us through the huge crowds, as we marched alongside the guards. Once at the Palace, being a sunny day in early August the crowds were huge, but again Matt managed to place us in the best position to view proceedings. 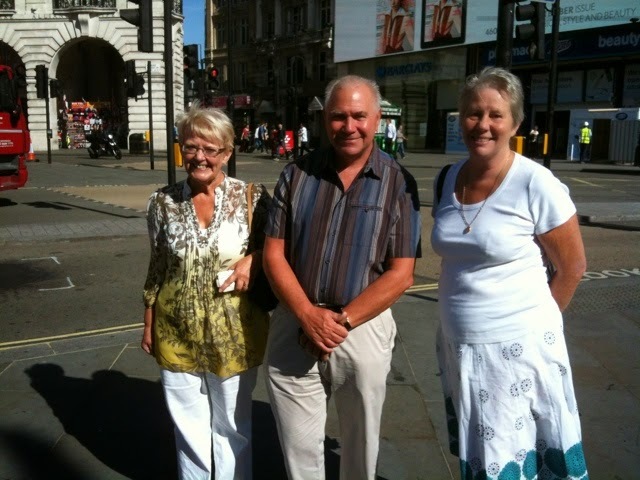 The tour ended at Clarence House, where we then made our way to Green Park station so we could get back to Leicester Square quickly for a drink and a bite to eat at the Moon Over Water, (Weatherspoons again). 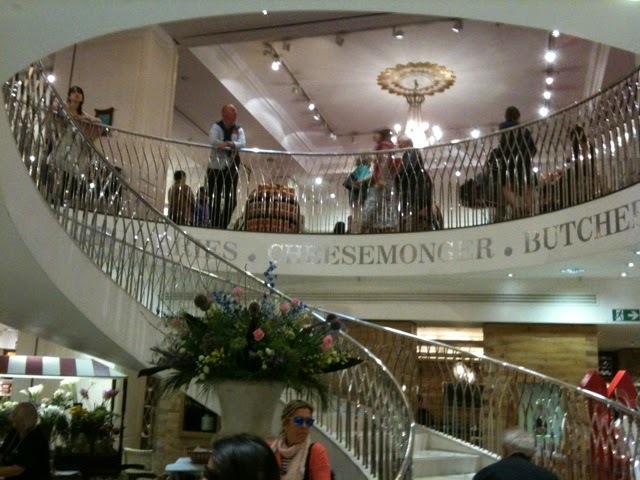 Then it was back to Knightsbridge and Harrods, Burlington Arcade, and Fortnum and Mason, before we enjoyed yet another brilliant afternoon tea at the Wolseley, http://www.thewolseley.com/afternoon-tea next door to the Ritz on Piccadilly. 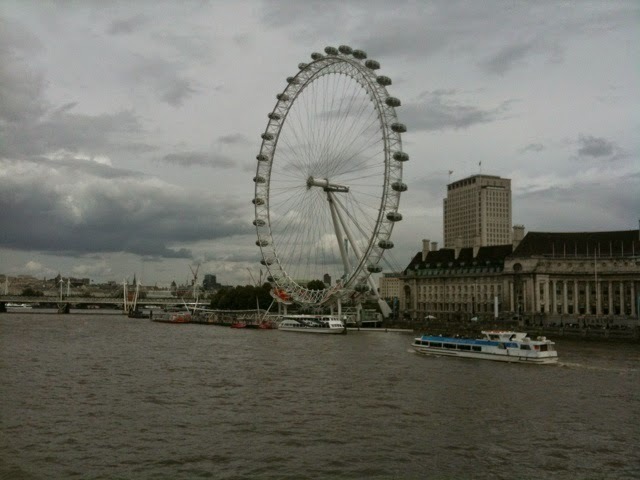 We have been looking forward to this trip for a while now - five days in London together with friends who we cruised with on Adonia's Grand Asian Adventure in January this year. 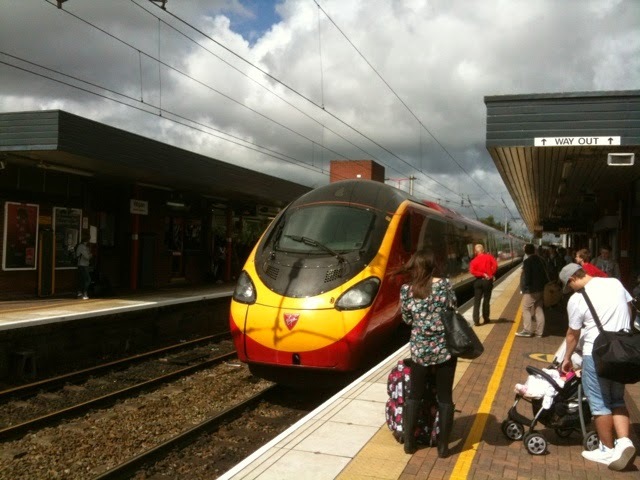 We joined the Virgin Trains Glasgow to Euston service as it passed through Wigan. We are staying free of charge at our daughter's place in the leafy suburbs while she is on a week's holiday in Spain and using the Underground to get around. 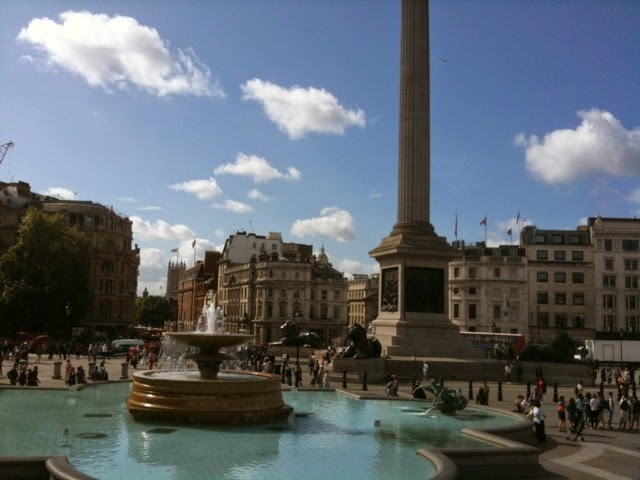 Today's plan was to arrive at Charing Cross for a look around Trafalgar Square before walking down Whitehall, past Downing Street towards Westminster where we had a guided tour of Parliament booked for midday. 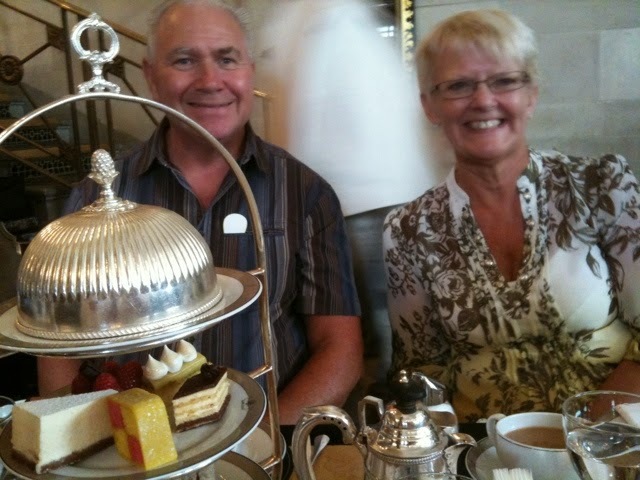 Tomorrow we have a walking tour booked which will give us excellent views of the changing of the guard at Buckingham Palace, before we take afternoon tea at an establishment on Picadilly. 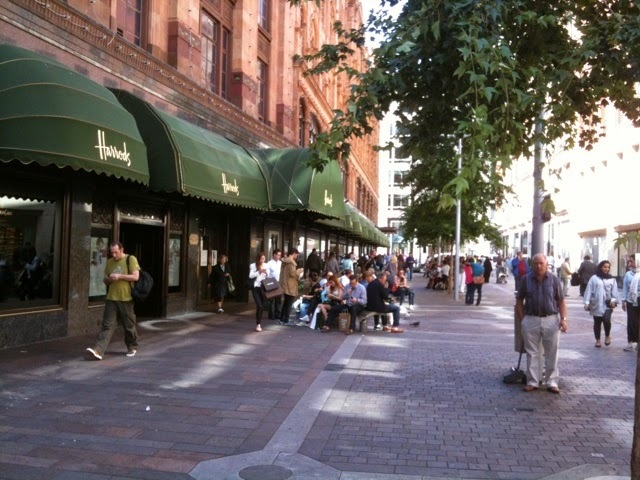 We will take in a visit to Knightsbridge in between. We have left Thursday free so we can get as many attractions in as possible within the day before we return to Wigan on Friday. We have reached the last day of our stay at this great site, and just as forecast the weather has started to break. 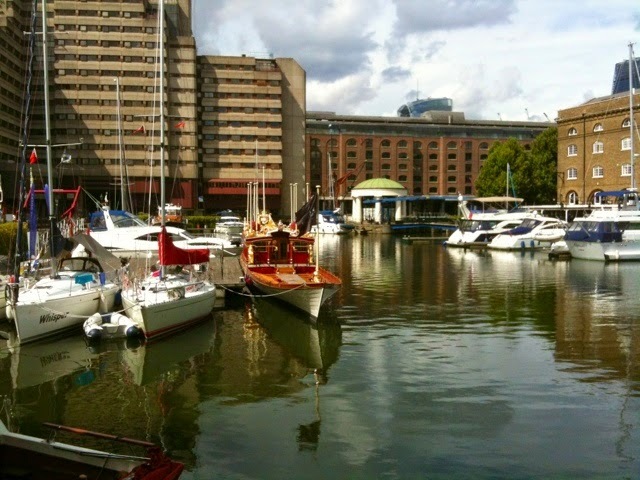 We woke to light rain, which has now developed into light cloud cover with sunny spells. We plan to travel home tomorrow, so with the forecast in mind we packed the awning and bikes up last night, and decided to spend a quiet day in the immediate vicinity today. 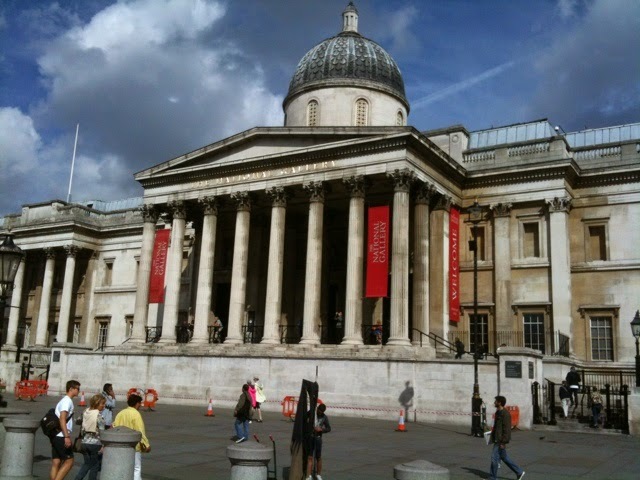 I decided to take the opportunity of describing some of the facilities and history of this site. The grand entrance gives away that this once used to be the site of a grand house and country estate. The original manor house was built in 1821, and was originally called Sans Souci, (without a care), and it was used to offer sanctuary to the French aristocrats fleeing the guillotine. In 1890 the house was bought by a wealthy country land owner from Oldham in Lancashire, Elliot Lees. The family had made their fortune from the Lancashire cotton industry. Lees transformed the house, adding to it and extending it. In 1905 he built the lodge at the current site entrance, and in 1907 moved a road so it would be away from the house. During the 1914-1918 war the house was used as a military hospital, and Lady Madeline Lees was a nurse here. During the 1939-1945 war the estate was commandeered for military use as an American tank base. Just before D Day the site was bombed, and shrapnel holes can still be seen in the walls of the lodge. 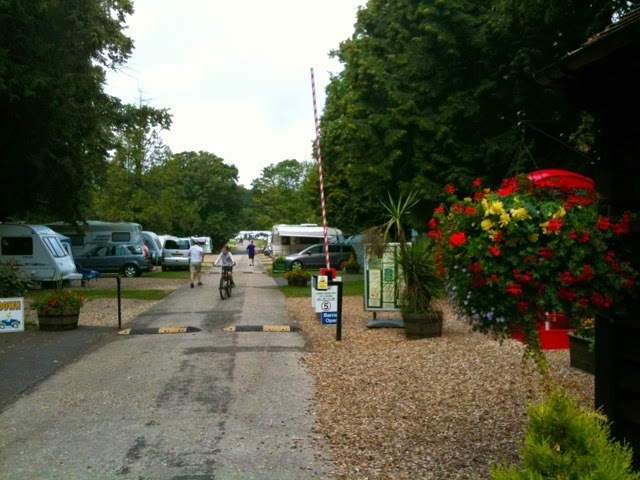 The current concrete drive through the caravan site was laid to support the weight of the tanks. After the death of Sir John Lees in 1957 the whole 13 acre site was sold to Dorset Council for £10,500. 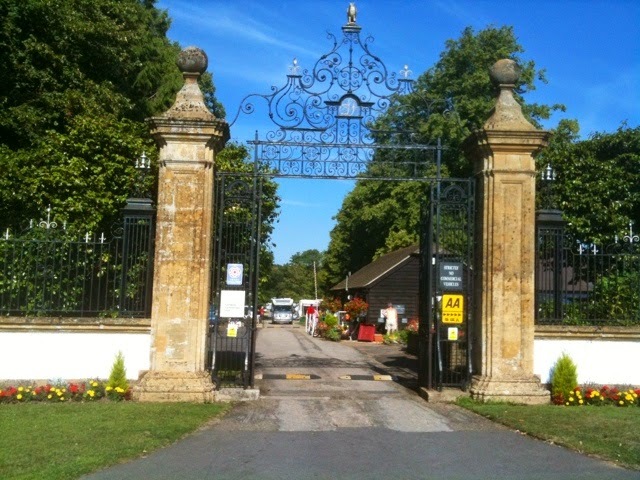 The manor house was converted into a comprehensive school, and is still used for that today. 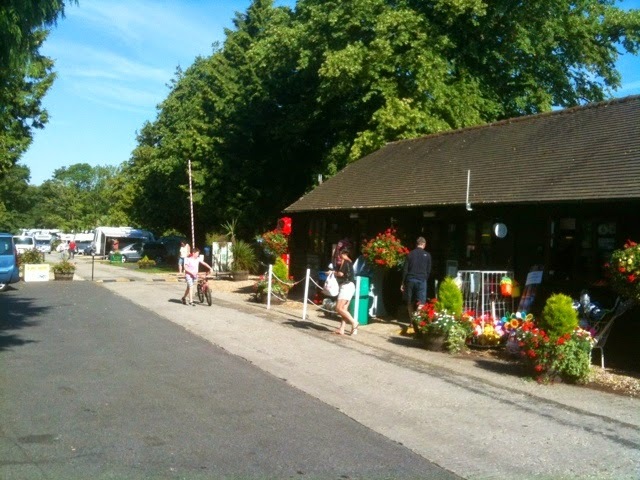 The lodge and land are used for caravans and camping, and the stables and courtyard are used as a craft centre and Dylan's cafe. 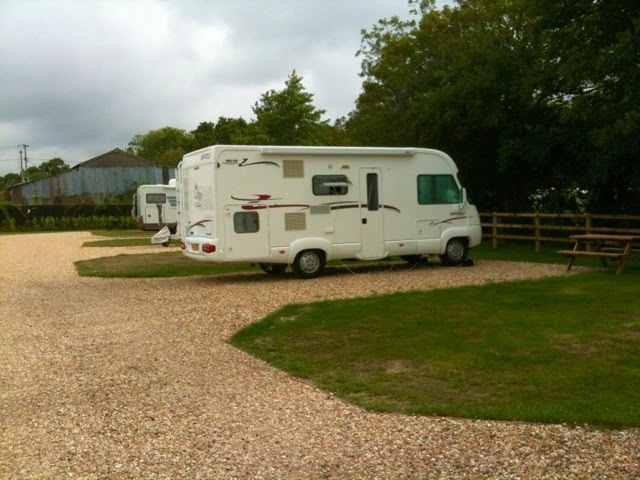 Caravan site customers are offered a free tea or coffee here and a free bottle of wine with a meal at the local pub, St. Peter's Finger, on the edge of the estate. 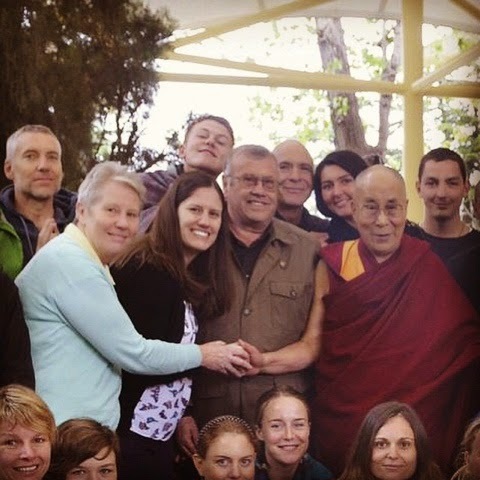 The whole site is maintained in a pristine condition. 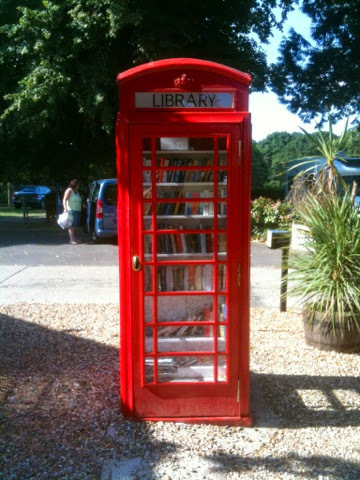 The above telephone kiosk has been converted for use as a lending library and book swap. 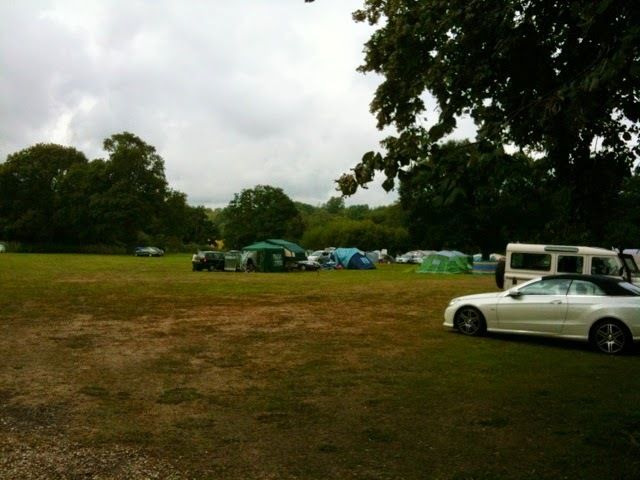 The main camping field for tents is just to the left of the entrance. 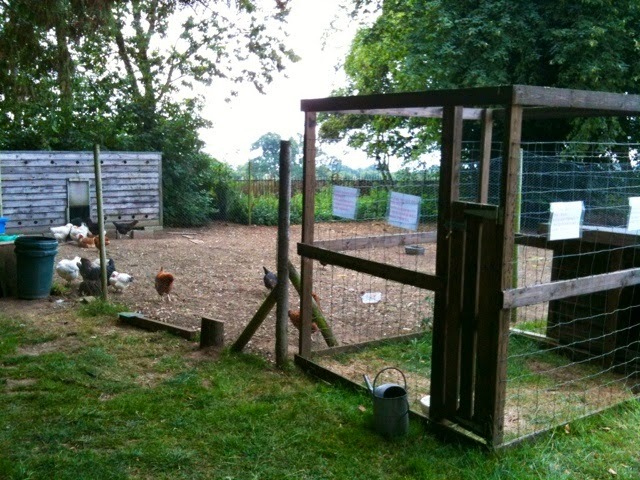 Chickens kept on site opposite the lodge provide a supply of fresh eggs for the site shop. Fresh baked bread is also delivered daily. 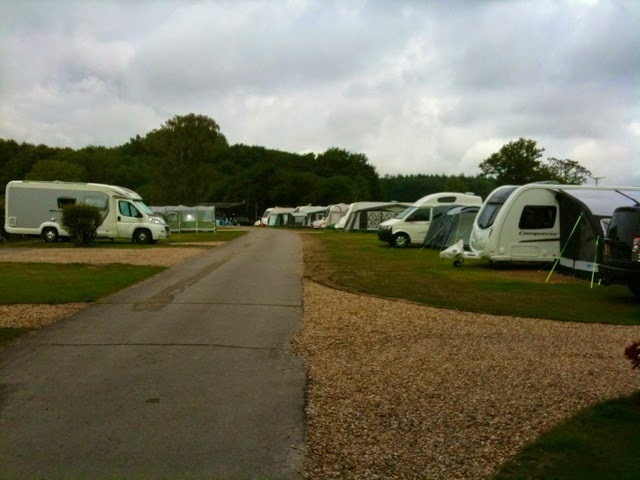 Other provisions and a small range of caravan accessories are also sold in the site shop. Daily newspapers are also available. This is our pitch. We have now taken down the awning and packed up the bikes ready for our departure tomorrow morning. This site, off Dorchester Road, Lytchett Minster, Dorset, is highly recommended. It is an AA 5 pennant site and allows very easy access by whatever your choice of transport to the wider area.